Braheim Fowler shows off the bat his father, Devon, bought him for his 12th birthday. 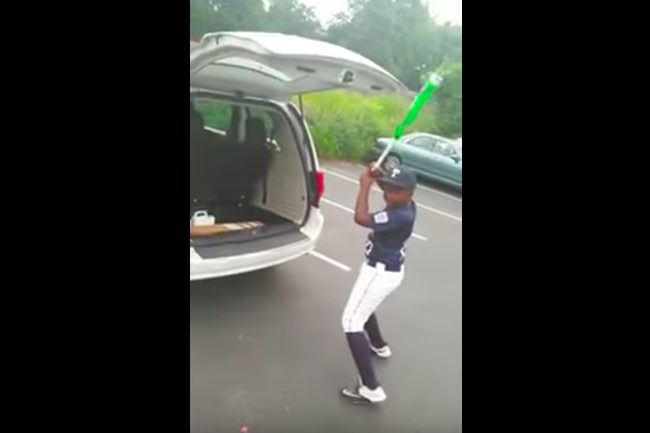 Last summer, Devon Fowler surprised his son, Braheim, with a neon green baseball bat for his 12th birthday in a viral video that earned members of the Philadelphia family an appearance on ESPN. This year, Braheim provided a gift for his father during a baseball game on July 17 – about one week before his 13th birthday. Using his treasured bat, Braheim smacked a home run to center field – right where Devon was watching the game. Screaming with excitement, proud dad caught the ball. But he not only snagged the ball, he caught the entire event on video – just like he did last summer. The video served as a sequel to their interaction one year ago, when Devon pretended to forget about Braheim's birthday. In that video, Devon recorded his downcast son as they hopped into their vehicle on the way to a Taney Little League game. As Braheim moped, Devon instructed him to pull out a box from the trunk. Braheim's demeanor instantly changed upon seeing the box. A broad smile crossed his face and he began to tear up. Braheim reached for a hug as Devon told him he hadn't forgotten about him – or the bat he had requested. The video led to an interview on ESPN, where Braheim acknowledged he and his father "had a moment right there." Toward the end of that moment, Devon told his son, "I want to see some home runs. I love you." Devon got his wish – and a baseball.